I am so excited to introduce you to Cate! Cate is an amazing Wrapunzelista whose stunning wraps and style are an inspiration. She radiates joy, and I can’t wait for y’all to learn a little about her! There was this stunning Muslim girl in one of my classes who wore a turban perfectly wrapped and it was so regal I couldn’t help but stare. When I first started wrapping my hair I was in love but I would also get frustrated easily because I’m seriously a perfectionist and this craft definitely takes a lot patience! Now that it has been quite some time since I’ve started (I think it’s been close to a year), I’m a lot more confident with my techniques and feel a little bit braver to leave my comfort zone and try new styles that I normally would never go for. A memorable moment was the first time a stranger complimented how stunning my wrap was when I was feeling kinda self conscious! I don’t really remember how I found Wrapunzel but a friend recommended I join the community group on Facebook so of course I couldn’t move quick enough! What inspires your head coverings? Please tell us about your style – how do head coverings help you express your personality? I have such a weird style that it’s hard to put it into words! A little bit old school, a little minimal but mostly all over the place haha! My wraps are very different and funky but almost basic so I guess that explains me! Do you match your head scarf to your outfit or the other way around? I tooooottally match the outfit based on which scarf I’m in the mood for! What are your favorite colors and styles to wear? I love love love like dusty rose, greys, blues, purples, and earth tones! My favorite styles are probably Shira tails, the Marrakesh turban (a new found love), anything with twists, and a basic turban with angled front! PLEASE share with us your tichel tying tips and tricks! So some tricks that have worked would be wearing a wig grip underneath your shaper, the further forward you pull your shaper and scarf the better the whole wrap stays, if you show hair try changing up your part style, it gives the wrap a whole different look. 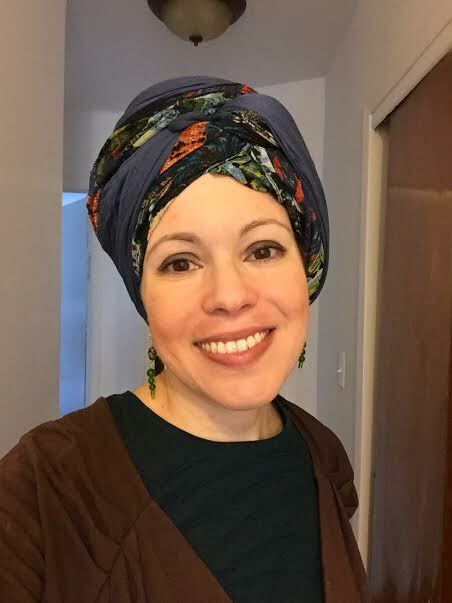 Covering with scarves has promoted a lot of growth in regards to my love and intentions for the mitzvah of hair covering (with every new style I fall more and more in love with hair covering) which has then led to the increase in confidence and understanding of my position in the world. What are some of the most important hair covering lessons you’ve learned over the years? I’d have to say to take it slow, baby steps. If you overwhelm yourself when you’re not truly ready for something you may resent it and not want any part of it (unfortunately I’ve been there). Have you had any cool experiences or realizations since starting to cover? I think some cool experiences were things like unexpected people asking me to show them how I did that particular wrap. Or the times when I’ve spotted a fellow wrapper in the wild! I actually have had some amazing realizations since covering and covering with scarves. If you’re a good and mindful person with pure intentions and always kind, it transforms you and the light shines out from within and is displayed across your face which then totttallllyyy enhances the wrap or whatever your choice of hair covering! Also, you shouldn’t (I know it’s really hard) give a damn about what anyone thinks of you! There are always going to be haters and people who make comments or stare but you keep being the queen that you are! What recommendations would you make to someone just starting to learn how to tie? For all my fellow perfectionist ladies, be patient, and don’t give up! It can be frustrating sometimes and tichel tantrums are soooooo real but just breathe! Also learn the fabrics that work best for you, some are easier than others. Jersey fabrics are a great one to start with because they’re super stretchy and easy to manipulate. Absolutely! Remember we are all royalty and we should always treat each other and more importantly our selves, as such so always always always be kind! Wear your crown and stand tall my darlings! What are you grateful right now? Omg literally everything! I’m constantly aware of the things I should be grateful for because it’s so much! My husband, my vision, breath in my body, this wonderful community of women, EVERYTHING!